Giving back to the community can be very rewarding and a great act of selflessness. Giving away some of my artwork has been part of my journey in art so far, and is becoming part of my repertoire— for now. I find it very rewarding at times to give a piece away, and I enjoy how the gesture surprises the hell out of some people. Once, I gifted a painting to this woman and the look on her face was priceless. She was so shocked, she almost looked disgusted. I couldn’t stop laughing. I loved it. These examples are not always the case though. Some people react awkward, even though they wanted the piece in the first place. If you plan on giving away a piece you should, unequivocally expect nothing back. Not a pat on the back, not even a thank you note. Don’t expect much praise. You should do it because you want to and because it’s for a good/helping cause. Sometimes I do it, because I feel people “need” it. A huge advantage is the tax break for your charitable donation. Obtain some sort of receipt from the foundation. You can write it off. Create something provocative and that people will talk about. Make your piece stand out. Brag about it on social media. Seriously. Do it. Be mindful of how much time you put into your project. Set up a firm deadline with ample time before the event date. Donate the piece and be done with it. If you’re going to donate a piece for an auction, be ready for whatever the piece fetches at the auction. If you attend the auction and the piece doesn’t fetch what you valued it at, don’t be surprised. Out of generosity, and to helping to promote the causes of others is priceless. I CREATED THIS PROJECT TWO AT A TIME. SINCE I WAS DONATING ONE, I WANTED TO KEEP A SECOND ON STANDBY. NOTE: THEY ARE NOT THE SAME BY ANY MEANS. I made two CANTO VII’s because I wanted to keep one for my next exhibit. Not for me to keep. CANTO VII led me on a different path that I had been on, and propelled me into unchartered territory in my art journey. I found myself operating on an entirely new level. The ideas that came out of this project were ones I never imagined. It all started from one simple idea: the shells. I started a whole “beach life” series incorporating the shells. My friend in Miami was so excited for me that he and his wife donated a whole bag of beach shells they had picked on their vacation near Sanibel. I was blown away by this gesture. He was so excited to see on my IG feed (alfresh22) that I was picking shells in Cocoa Beach, that he called me that same day to offer me a bag of shells from Sanibel. This was completely unexpected. glitter, beach sand, shell, and resin finished. I created a triptych using the beach shells and named it PEPPERMINT SPLATTY. Peppermint Splatty, really? Are you kidding me? Never in my mind did I think i would paint something that looked like peppermint bark, let alone name it Peppermint Splatty. I didn’t even know peppermint bark was a thing. I made a video for my You Tube channel https://www.youtube.com/watch?v=QbAYDoIHYCc on creating the resin coated backboard and mounting Peppermint Splatty. I made this amazing mixed media flow painting mirror piece. 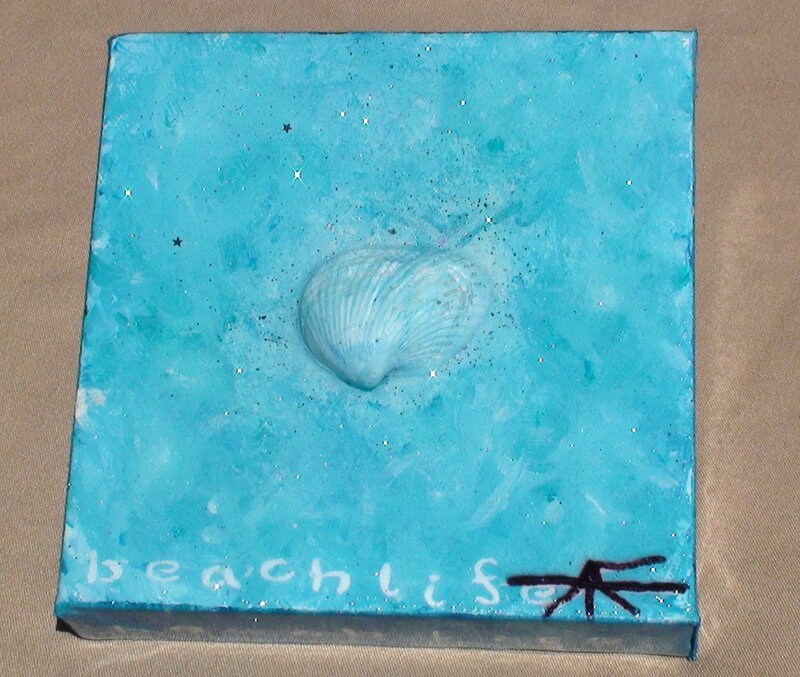 I used the beach shells, glitter, acrylic, beach sand and coated it with resin. My point is this: all of these amazing things happened because of one simple idea of creating a piece and donating it to a fundraiser. This was pretty amazing. All this happened because of my desire to create and donate this idea that I sketched out on piece of cardboard and titled it CANTO VII. SK3: FINAL SKETCH & IDEAS… ON A NAPKIN. NOTICE THE DIFFERENCES FROM THE FINAL VERSION? Sketching is an integral part of my creation process. Notice the difference in the ears between sketch 1 and 2? I shared my sketch with a coworker who is a big Disney fan. She pointed out that the ears in SK1 looked like “Pooh” ears, not “Mickey” ears. I hadn’t even noticed. I would’ve been upset with myself if the finished version looked like Pooh ears and someone pointed this out to me after the fact. This is just one reason why sketching is important. Link for my “sketching” blog is located at the end of this blog. This project took longer than I had anticipated. To date, this is the most hours I have put into a painting. I kept the mood light by having fun while putting in the work. Also, by poking fun at the mouse via social media. I knew I was always going to incorporate the Cocoa Beach sand and sea shells into the project, but didn’t know exactly what the project was going to be. Mickey was not thrilled by my take on a dystopian society, greed, and feeding the machine. PICS FROM MY SOCIAL MEDIA FEED. Disclaimer: I don’t really have anything against the mouse. My original intent was to paint a seascape sunrise for the fundraiser. I knew there were going to be local artists also donating artwork, so I wanted to ensure that my piece was going to stand out. I needed to think outside of the box. I had to challenge my artistic creations up to this point. CANTO VII was unlike any other piece I have created to date. The idea for the castle was to give it the illusion that it was floating in space. It also tied into the action/drip painting theme of painting in the “space” of thin air. I designed the road curvy to give it a surreal, magical and whimsical feel. The rings represent four of the nine levels of hell in Dante’s Inferno. The planet Pluto is the “fourth ring of hell: GREED”. That is not Earth’s moon. PLUTO SIDE NOTE: Isn’t there a Disney character by that name? Interesting. For the words (I NEED MORE CHEESE) I designed a spiral paying respects to the golden ratio. The spiral is also symbolic of Mount Purgatory’s spiraling pathway to paradise in Dante’s Inferno. This stage of the project took many hours to get visually “right”. For the CANTO VII borders, I used the custom dollar bill symbol stencils that I created specifically for this piece. I felt that decorating the borders with the dollar bill stencils was apropos to this project because of the message of greed in CANTO VII, and it also brought everything back to the purpose of the whole project: THE SURFSIDE PLAYHOUSE FUNDRAISER. Raising money for the theater. Dollar Bills ya’ll. 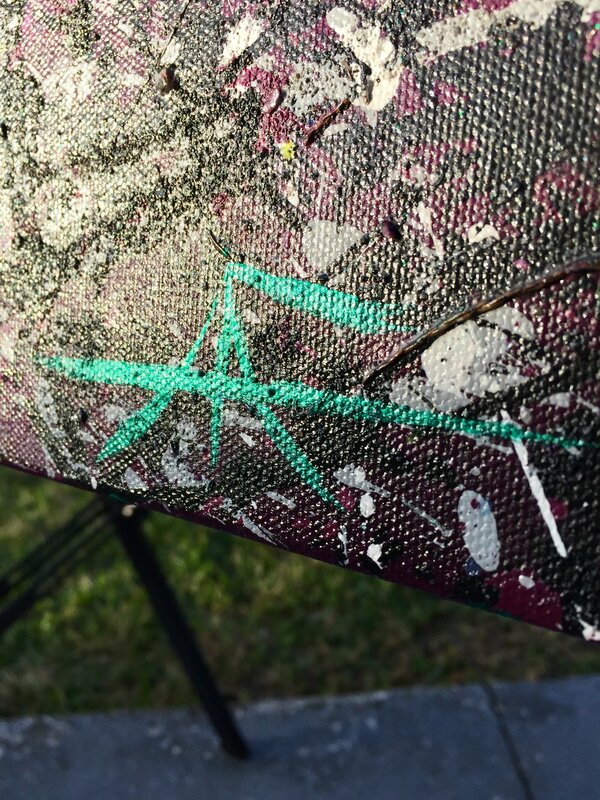 People like it when an artist pays attention to the smaller details. I’ve been told my border work is like another layer of artwork added to the painting. Don’t be fooled: It’s not as easy as it looks. It’s tedious at times and it can take hours to get the borders to your liking. Sometimes I stencil on borders, at other times I drag the paint right over the edges. If your intentions are to make a happy buck off of a painting, this may be something to consider. This doesn’t necessarily mean you have to incorporate this technique to every painting you create. It doesn’t always work on every painting. It’s strictly up to the artist. The protruding seashells are camouflaged into the design. They’re probably my favorite aspect of this painting. When you look at it from a slight angle, they pop out and the painting appears to “move”. It’s a very cool 3-D optical illusion and it makes people physically move around the painting. In closing, my philanthropic endeavor (albeit not from a financial standpoint), has been an enlightening experience. Many great ideas and projects came from one small idea, over a three week period. They say good things come in small packages, and the CANTO VII sketch is truly the epitome of that adage. I hope you enjoyed this insight into my journey in art. Here is the video to the Peppermint Splatty Tripytych resin project. Thanks in advance for supporting my art and please subscribe to my You Tube channel, Complicated Art Man. Thank you for your interest in my art and stopping by the C.A.M. blog. KEEP PAINTING & STAY CREATIVE! Hello everyone. Thanks for stopping by the C.A.M. blog. I’m writing this blog to post pics of my recent projects as well as a couple of older projects that I revisited and touched up. This is mostly a picture blog, so enjoy the pics. This project is actually from 2015. I created it when I was living in Miami. Just recently, I resined over it with some leftover resin from a different project. When working on a resin project, have a second project nearby for the leftover resin. Resin is expensive and there is no sense in wasting the leftovers. Even if you use it just to experiment with. Resin projects are fun there are alot of cool things you can do with it. One example is mixing it with paint. The more you practice working with resin, you’ll become more familiar with the characteristics of it, and in turn, the better you’ll get at creating projects with it. For this piece, I rubbed resin over the lake portion of the painting, with my fingers. The resin really made the lake pop and gave it a cool effect and brilliance. I also rubbed the borders with resin and gave them a nice finish. I think I will put this painting in a shadow box and call it finished. I’ve been wanting to paint a “Tree Of Life” painting for quite some time now. Many of my landscape paintings have multiple trees in them. However, I never got around to creating a T.O.L. painting. For this one, I started off by sketching some ideas out in my journal. The initial idea was to make a big painting, about 18” x 24” or 12” X 36”. Building on that original idea, I decided to downsize the project and enhance the outline of the tree by resining it. This idea came out pretty good and I was quite satisfied with the results. I think I’m ready to move on to the bigger version now. Sometimes it’s best to keep an idea simple and start out small, or even with a minimalist palette. Some of my coolest paintings have been done by just using three or four colors. FROM THIS ANGLE THE TREE OF LIFE REALLY POPS. I created a variety of colored resins using acrylic black, reds, white, and clear resin for this triptych. I added the Florida seashells to this project to lighten up the pieces. For the technique, I dripped and swirled the resin mixture onto the canvas with bamboo skewers. The skewers never touched the canvases. I was painting in thin air again. 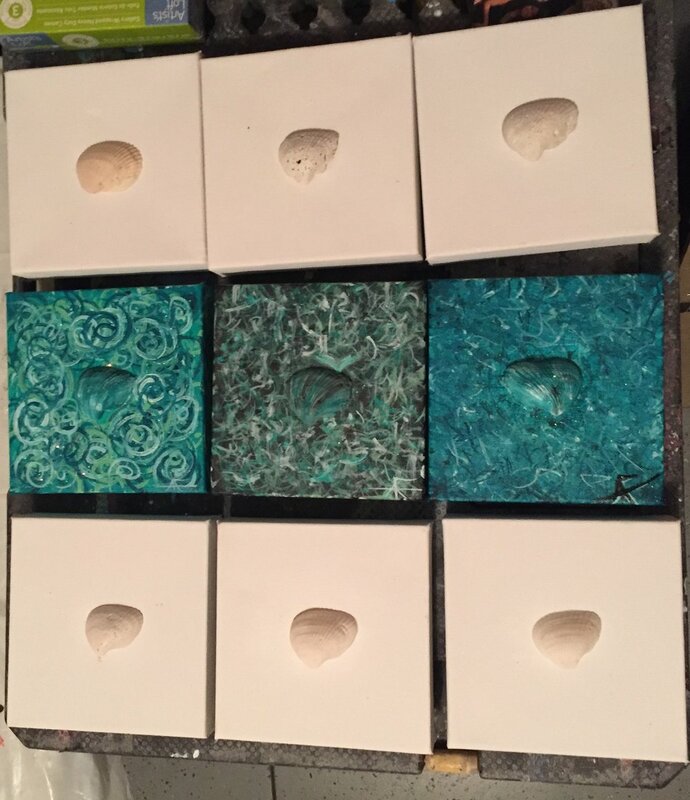 To solidify the seashells to the canvas I dipped them into resin and also drizzled resin around their edges. This is one of my rare paintings. Mainly because I hardly ever paint animals or people for that matter. It’s just not my thang. I was very intrigued by the Flamingos I saw in Las Vegas. I enhanced the lake with a light coat of resin. Once again, I applied it with my fingers. The picture doesn’t do justice to the resin techniques. MORE SHELL WORKS IN PROGRESS. As always, thanks for stopping by the Complicated Art Man Blog. Stay creative and keep painting! Every now and then I feel compelled to gift away a piece of my artwork. There is no rhyme or reason to my decision on this matter. Sometimes it could be someone who was really impacted by my artwork, or someone who made an impact on me at some point in my travels and adventures in this thing we call life. Or just me simply giving recognition to someone for something they did for me. I do feel there is a big difference between someone wanting a piece of my artwork, versus someone needing it. The first piece I ever gave away was Buff Buddha. Incidentally, Buff Buddha is the ONLY person piece I have ever painted. I rarely and I mean rarely paint people and animals. They just aren’t my thing. I have been sketching around with a jelly fish lately though. At my first ever art showing, my lifelong best friend and his wife showed up to support me. His wife wanted to purchase BB from me, and I told her that I couldn’t sell it to her. I also told her that I wouldn’t give it to her. What a dilemma, right? It wasn’t that I was attached to the piece, I just couldn’t accept money from my friends that I’ve known for over 30 years. She looked at me in disbelief, but accepted my decision and logic. We moved on. At that moment, I had an epiphany. I knew that I had to let Buff Buddha go. Especially before he became a casualty. I made a decision that I would gift it to my friend’s wife that day. Not only did she wan it; she needed Buff Buddha. After they finished lunch, they came by my tent and I remember his wife looking at BB indifferently saying, “There he is, Buff Buddha.” Then she shook her head and walked away. She couldn’t believe it. She was stunned. I couldn’t believe how grateful and shocked she was. I felt so awesome that someone felt that way about me giving them a piece of art that I was stunned, lol. By the way, if you ever feel inclined to give away some of your artwork, don’t expect a reaction like the one she had. More on that later. I knew that something had happened to me at that moment, on that day. I had come to a realization that my endeavors in art were not all about selling my art. It was the story about my journey through art and the experiences with people I would have and have had, because of art. I never sold a piece of art that day. I gave away a piece to someone who needed it. 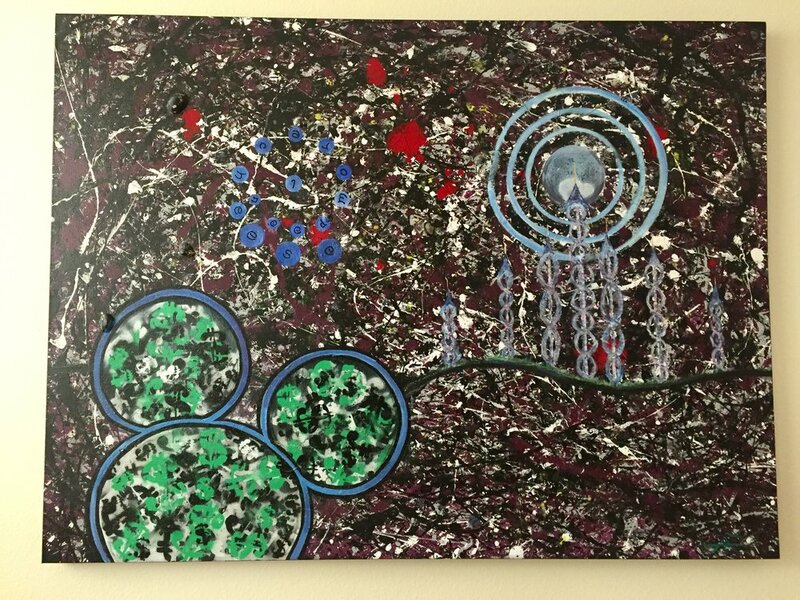 A few weeks later I sold my first piece of art, right out of our home to a friend of my folks. Moondancin and Return of the Perseids were gifted to a gallery owner and his wife in Orlando. He helped me launch my first ever public gallery exhibit. I sold three paintings that night and another a week later. If it wasn’t for his invitation for me to exhibit, I may not have for a couple of more years. Thank you. I was extremely grateful for the opportunity that was presented to me. The look on his wife’s face was priceless when I took her favorite painting in my exhibit, right off of the wall and handed it to her. DREAM DOORS & ROSE (CIPHER IMBEDDED) - JACKSONVILLE. 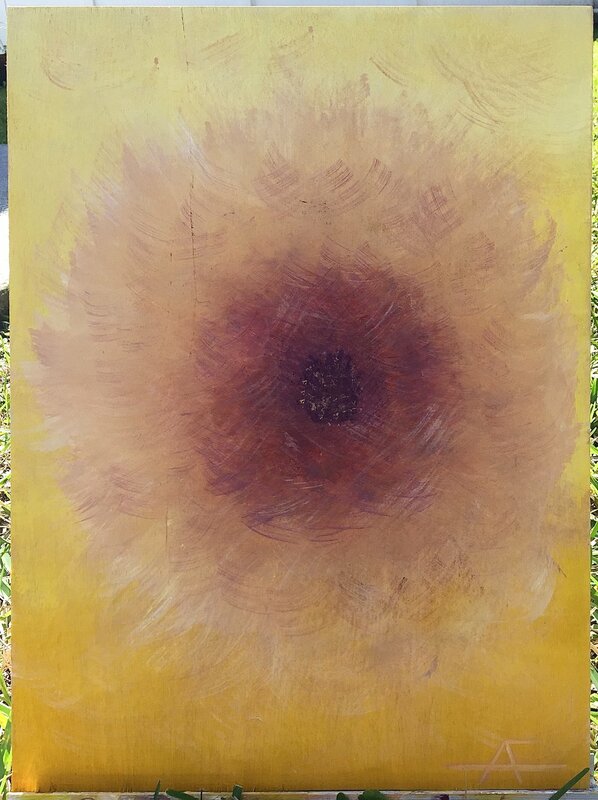 One piece I gifted, called Fuzzy Flower, was to a coworker at a bar in Miami. This guy made me laugh so hard at the dysfunctional operations of the establishment that I was borderline hysterical. I’ll never forget that night. 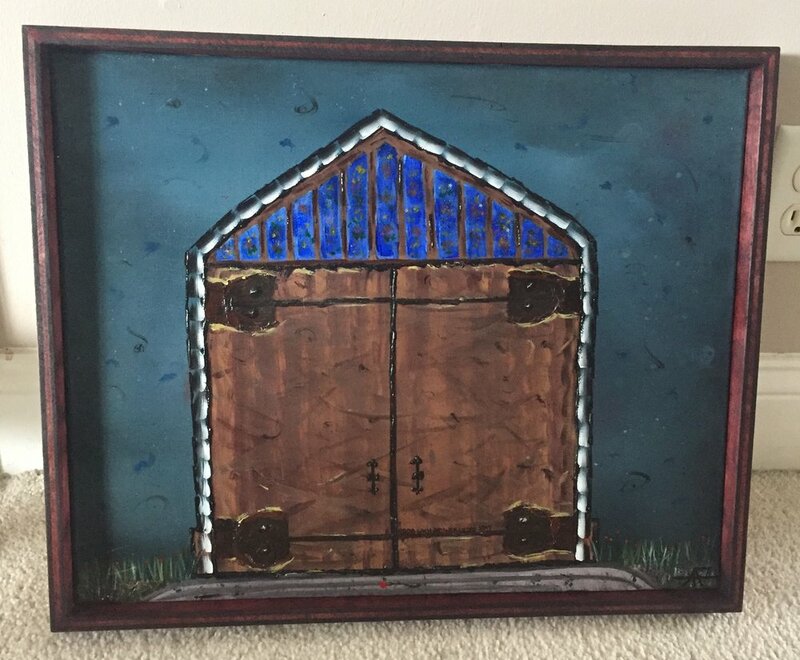 A couple of years later, he and his wife had just moved to Idaho and knowing how financially difficult and exhausting a cross country move can be, I mailed them a piece he had been eyeballing about a year before. The piece was sitting in a box and I can across it one day looking for another piece that I was about to sell. Again, I knew what I had to do with that piece. Someone “needed” it, and I was going to gift it to them. Seascape dreamscape was gifted to the owner of the Castle Otttis in Vilano Beach Florida. He granted me permission to visit the castle and I was very thankful. I waited over 20 years to visit the Castle. Since my first visit, I’ve returned to the Castle a few times and the owner and I have become friends. The Castle Otttis is located about ten minutes North of St. Augustine in Vilano Beach. Castle Ottis is a stone cold stunner and a work of art. MD2 was gifted to my friend and his wife. They came up from Miami with their son to visit me one weekend. We had an awesome time at Universal, catching up and riding the coasters. Before they left my friend commented on how much he liked this painting & how my artwork had progressed. I thanked them for the visit and before they got in their car, I surprised them with Moondancin’ 2. I guess you can say I like the element of surprise. Tres Palmas was gifted to a checkout girl at Publix during the holidays in early December 2018. As I was checking out, we realized we both shared a mutual unenthusiastic feeling for the “holiday season”. Although, I was a bit concerned that someone so young was so disinterested and unhappy during the holidays. It kind of bothered me. Possibly because I had recently found out that someone I had crossed paths with a few years ago, had taken her life. Reading about it had really left an impact on me. We had a lot of talents in common. I guess that’s why when I saw the lack of Christmas joy in this young girl’s face, I was compelled to do something about it. I felt like she needed some holiday cheer and uplifting, so I gifted this one to her. Giving this one away during the holidays helped put me more into the Christmas spirit. My great great friend Mary lives in South Florida and she has made a huge impact on my life. She’s Irish and my original idea was to paint her an abstract Shamrock for her birthday. Luckily, I found out from a friend that she loves, loves, loves tulips. I did manage to fit in that abstract Shamrock though. Can you find the Shamrock? Slainté. This includes recognition, a thank you card, or any sort of gratitude. Some people just don’t know how to react when you give them a piece of art. It could be awkward or maybe they just didn’t like it lol. Don’t expect them to jump up and down either. Once you’ve given it away, you’ll probably never know where it will end up. Try not to be upset if you find out your masterpiece ends up in the guest bathroom or on their floor. It’s theirs now. They can do whatever they want with it. Make sure you sign the back if you have time. I try to include some sort of thank you, or gratitude statement. 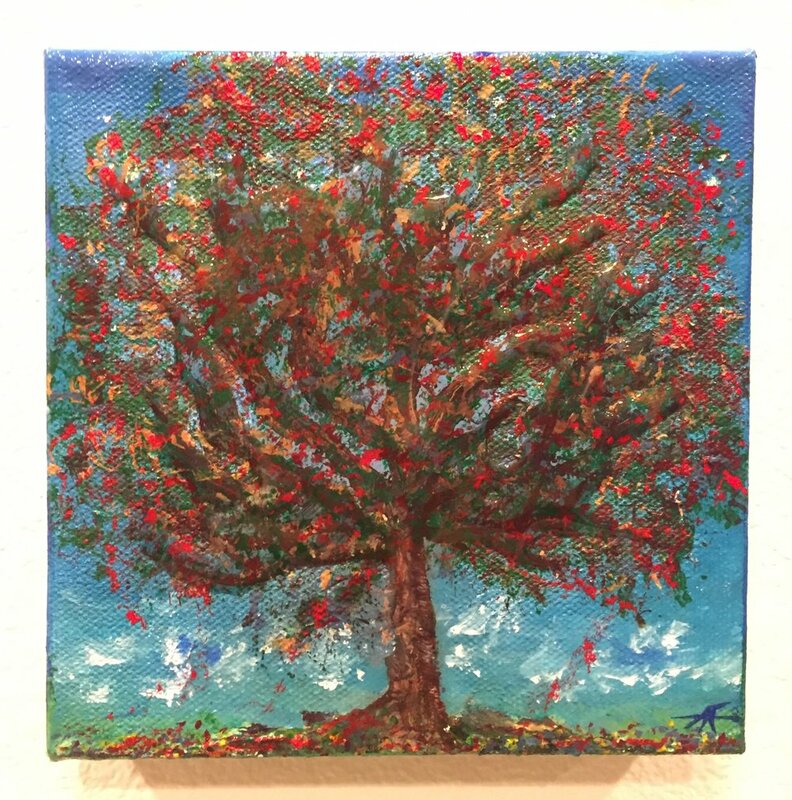 Donating a piece of art to your local community for fundraisers or benefits is a great way to get your name out there. Make sure you give them a short backstory on the piece and your social media info. The story behind a painting is just as important as the artwork itself. If they have a social media exposure, try to work out an angle where they promote the piece of art that you donated. CANTO VII (MIXED MEDIA ON CANVAS) 3’ X 4’ -acrylic, sand, sea shells, tree twigs, spray paint, and glitter. STAY CREATIVE & KEEP PAINTING! Good day to you. Thanks for stopping by the CAM BLOG. Today I wanted to take a quick moment and share a recent project I’ve been working on...So let’s get to it, shall we? FIRST UP: A Black & White piece. Black resin on 12” X 36” canvas. In all actuality, this was an experimental side piece I created from left over black resin. I knew that I wanted to create something from a minimalistic perspective and try something new. I kept the palette simple and used large bamboo skewers for the drip technique. My window of opportunity was not too wide open. The resin was starting its firming up process. As the project continued, I had to change dripping techniques with the bamboo skewers. The experiment was taking on a life of its own. I was just there for the ride, lol. Each stage took me on a different ride. When I first started the project, the resin was still very loose and drippy. I was able to manipulate my curves with ease. As time went on, the resin got a little firmer and I had to change my dripping technique. With more ticks passing by on the clock, the resin transformed itself into a glue like character. The glue stage actually created a new effect on the painting and thinned the resin down some. I used this opportunity to give myself another layer to work with. This stage also added another layer & depth to the painting. As I got comfortable with each stage of the process, my comfort zone was short lived. The resin decided it was time to transform, yet again. Each transformation was dictating in which direction the project was headed. Lastly, the resin transformed to a spider web like substance. This was the trickiest stage to work with. Once again, I had to change my technique. This time, dripping the resin from about 18 inches from above the canvas, then working my way towards the canvas and hovering the skewer all over the canvas. It was just as if I was working with spider silk. That’s what it looked like as well. Oh, what I tangled web I had woven. That voice in my head was telling me that this experiment had ran its course. Let’s call this one finished. Venomous. Resin is alot of fun to work with, even though that manipulation time may be about an hour. Once the resin is setting, you can add more layers and colors to your project. this will give your project a 3D effect. Use a blow torch for bubbles. Give yourself a couple of hours. Never rush a resin project. If you’re planning to do a simple clear coat (table top) finish, you will only have about 45 minutes of time before the resin starts to cure. Using a blow torch to blow out the air bubbles is a must. Below is a link to my YT channel, complicatedartman. It is short vid on pouring resin on art. So just why is sketching important? In my experience, I’ve found that sketching is a great exercise to get your mind in a creative state. Sketching also gets me hyped up & motivated to start painting my project ideas. I’ve also found out that sketching is a fantastic way to work out potential obstacles that may be lurking ahead in your project. These obstacles may potentially spoil your future art endeavors. I guess u can say it’s like a pre gaming for your big project. In my experience, I’ve figured out that sketching has been very beneficial to me helping me become a more efficient artist. Another benefit of sketching is that it can help you gain a different perspective from the initial “masterpiece of an idea”, that you had in mind. Recently, I found out that sharing your sketch ideas with someone may be a huge benefit to your project. Their perception of your concept may give you a different perspective or other options in which direction to take your project. Sketching can also be a way for your ideas to naturally evolve into a painting. It can help make the transition from paper to canvas a smooth one. Possibly pre organizing your ideas from super complex and too many, to a less is more type of methodology. in conclusion, sketching & doodling are your friends. For me, it’s a way to “wake up” my brain’s creative juices and get my projects going. Working out those potential pitfalls through the sketching process has saved me time, and will save you time and headaches as well in your future projects. STAY CREATIVE AND KEEP ON PAINTING. Greetings art enthusiasts. It’s that time of year for the Avalon Wine Walk. I’m proud to announce that I will be one of the featured artists during this event. Many of my pieces will be on exhibit at the Avalon Realty Group stop. The Avalon Wine Walk event is organized by the Rotary club and many businesses in Avalon Park will be participating. This event is from 6pm-9pm. I still have a few loose ends to take care of before the show, but man has it been a learning experience. It has been great to get reacquainted with some of my earlier pieces & install hanging hardware on some that didn’t have any. I spent quite a few hours alone just getting some of the artwork “ready to be hung”, lol. Making frames and installing the hanging hardware is just another skill that I’m Getting better at, the more practice I get in. It is also another way to invest time in your craft that doesn’t involve painting. It’s a great alternative in case you aren’t in a “painting state of mind”. . . I’ve also learned that art that is “ready to be hung” is a great selling point. Here are a few pics and a sneak peek of my gallery setup. It has been quite the learning experience setting up for this event. I put in at least 15 hours in setup time from first artwork hung, to rearranging all the pieces, to making the exhibit labels. Of course, I had to add a few extra additions last minute lol. All in all, I was very happy with the display of my artwork & I’m thrilled that it will be on display at Avalon Realty Group in East Orlando through January 2019. Hey ya’ll. Hope everyone has had a fantastic Thanksgiving weekend. I know I have. I think inspiration is all around us, all of the time. Motivation has to come out of desire and want. Sometimes if I feel uninspired, I’ll visit a museum to get a different perspective on art or just get the creative juices flowing. That usually motivates me to want to create more. Other times, I’m just in a real creative state of mind and when that happens, one must strike while the iron is still hot. At the moment I have a few projects to finish for an art show/wine walk I’m taking part, in early December. I added another action/element style painting to my collection this weekend. Sizing up at 4’ X 5’, it is a beast and a monochromatic stunner. 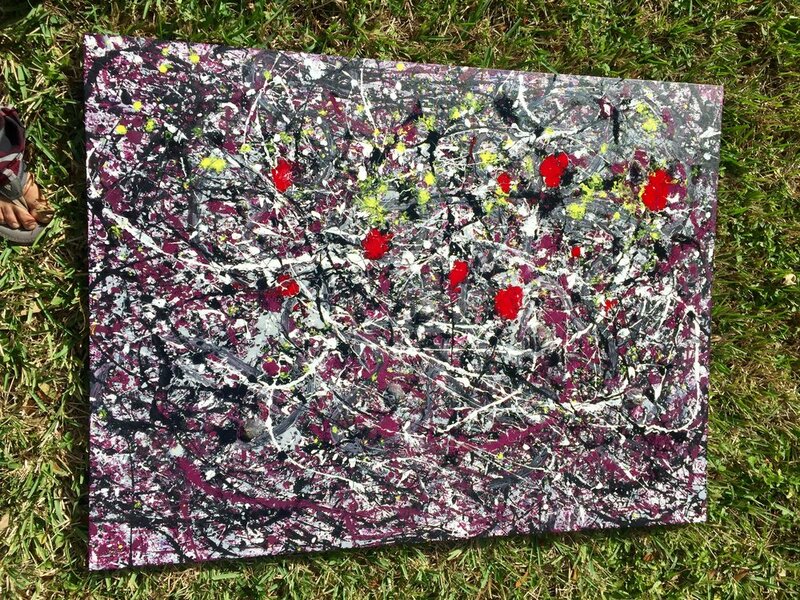 I titled it LITTLE RED DOTS. Well I promise you they are in there along with a few twigs that the wind knocked off of the treetops as I was creating this piece. I painted the twigs right into the painting. I feel it gives the piece another layer of organic character. My initial intention was to keep this painting in a monochromatic styled theme. focusing mostly on black, white, and gray. I started with whispers of dripped blue undertones on a blank canvas for some depth. After I had done my first layer of splatter work, I took an almost empty tube of Cad Red and gave it a few squeezes about two feet over the canvas, which produced the “LITTLE RED DOTS”. I promise: they ARE there. Here are some pics to prove it lol. This was my second action/element style painting and I’m very happy with the result. I paint these deep in the woods behind my house, so that’s where the “elemental” aspect of my description comes into play. “Whatever lands on the canvas, stays on the canvas.”, that’s what I say to myself as I’m creating. UNTIL NEXT TIME: STAY CREATIVE MY FRIENDS. 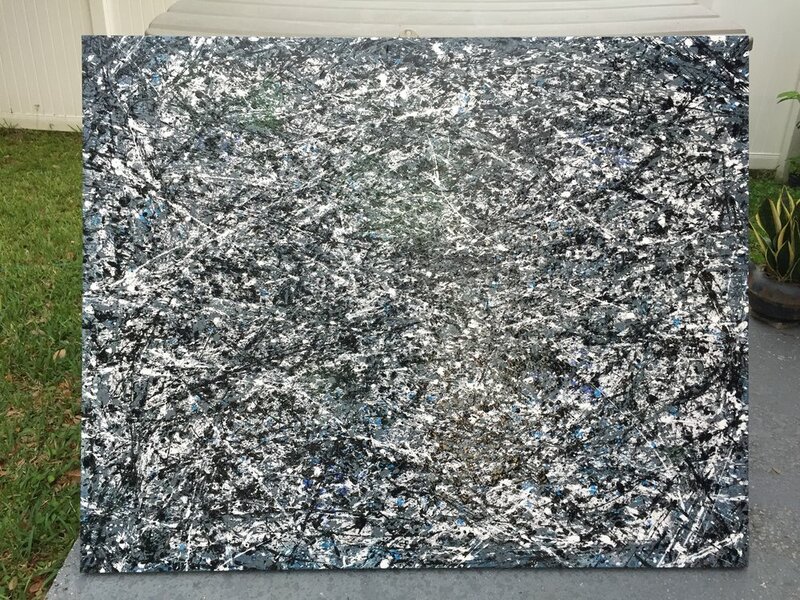 Recently, I found myself thinking alot about creating a Pollock style piece. I’ve never painted anything in that style, but lately I keep seeing his style of work everywhere I go. After doing some research on the man himself, I decided to jump in and go for it. I wanted to keep it simple, so I went with three colors: RED WHITE & BLUE and added some glitter just to give the painting some bling bling. I guess I was feeling patriotic. I got some old brushes together, some bamboo skewers for stirring/mixing the paint & a decent sized canvas (2’ x 3’) . I used acrylic flow paint. I quickly found out that it was not as flowy/loose as I wanted. So I thinned the colors out by adding some good ole H2O. That’s fancy science talk for water lol. Thinning the paints out with water was the trick. After achieving the proper flowy consistency, I was ready to rock it out. I found the creating process & style of this “freeform” of painting very liberating. There was no “right or wrong” way of doing it. I was throwing paint from left to right, right to left. Down and up and up and down and all around. Sometimes I was flicking the paint brushes, and other times, just dragging them over the canvas. I was literally painting in the air. I was creating a piece of artwork out of thin air. FASCINATING! I think I only struck the canvas three times during this creative journey. I even used the bamboo skewers. They were great tools for flicking streaks, splattering, & tapping out droplets. STATE OF THE UNION 2018 or COTTON CANDY DREAMS? I discovered many fascinating experiences during my Pollack Experiment journey. I felt many emotions of joy, satisfaction, and adventure. If I must say, it was pretty magical. It was a very free feeling experience. As I rhythmically maneuvered those skewers & brushes around through the air, I felt like a composer, leading his orchestra of paints on an art splattering journey. There were a few tricky things involved with this painting technique though. TRICK #1️⃣ Finding the balance between the three colors. I call it the “rhythm & flow” of the painting. TRICK #2️⃣ Determining when the painting was finished. Those two factors were the big decisions I had to make during this process. Once I found my rhythm & a level of satisfaction with the outcome, I was able to determine when it was time to let it go. In other words: FINISH, CAPUT, FIN, FINITO, BE OVER IT... You get the idea. There was even a surprise third TRICK. This serendipitous development was awesome. The natural color mixing taking place during the creative process, produced MORE than just three colors. Not only did I have RED WHITE & BLUE, but the color mixing created light blue, pink, and even values of violet & purple.. I found his fascinating. The painting was creating elements on it’s own. It had conjured up catalytic energies on its own will. Now that’s MAGICK! Anyhow, This experience has opened up my eyes and imagination further into my limitless and untapped creative energies. Thanks for taking the time out of your day, to peruse this article on “THE POLLOCK EXPERIMENT”. If you have any questions, feel free to ask in the comments, or hit me up on social media. Or email me via the contact link. Until next time: UNCLE ALFRESCO OUT!